FILE - Chinese Navy warships take part in an international fleet review. Chinese state media reported that apart from the scores of naval vessels in the live-fire exercises scheduled Tuesday, dozens of aircraft and “several missile launch battalions” with an “unknown number of information warfare troops” also took part. But the reports did not say exactly where the drills took place. Padilla and a spokesman for the Department of National Defense said they had no knowledge of the location. ​China’s defense ministry on July 20 posted a navigational warning announcing this week’s military drills. The coordinates listed on the notice show the area to be southeast of Hainan Island within range of the Paracel Islands, which Vietnam claims, and well north of the Spratlys. Galvez points to China’s rapid build-out of seven artificial islands in the disputed Spratly grouping in the sea. The Philippines claims six of those outcroppings and security analysts said at least one of the developed reefs would be able to handle military planes and ships. The artificial island-building has also raised concerns in Washington, which has called for it to stop. Galvez said China is acting without being “mindful of the impact on its neighbors. ... The successive events of aggressive actions now paint all their activities with concern and doubt." 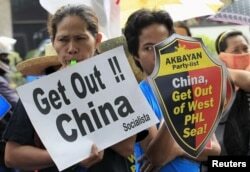 Protesters make noise during a rally regarding the disputed islands in the South China Sea, in front of the Chinese Consulate in Makati city, metro Manila July 24, 2015. China claims nearly all of the South China Sea. The Philippines, Brunei, Malaysia, Taiwan and Vietnam all have overlapping claims in the resource-rich sea traversed by ships bearing trillions in trade yearly. The mayor of the Philippine-controlled outcrops within the Spratly Islands knew even less about where the exercises might have taken place. “We just don’t care. We don’t mind because we don’t know if it’s not in the news. Our life is very peaceful. Life goes on on a regular basis,” Bito-onon said. He noted, for example, that the inhabited island of Thitu is 100 nautical miles (185 kilometers) from Fiery Cross Reef, where China’s building project appears to include a runway. Bito-onon said that if anything were to happen there, nobody on Thitu would know about it unless it was on the news. And besides, he added, fishermen rarely stray beyond 5 kilometers of Thitu's shores. Sam Bateman, an adviser for the Maritime Security Studies program at the S. Rajaratnam School of International Studies in Singapore, said the fact the exercises only lasted a day likely means they did not stray too far into the sea. Bateman said there is a “security dilemma” playing out in the South China Sea, with an action-reaction pattern. “We’ve had the issue with the USN (U.S. Navy) had recent exercises with the Philippines and of course they can be provocative towards China and likely could well provoke this sort of response from China… having its own exercises,” he said. China has announced another set of military drills scheduled to begin Saturday, in an area just east of Hainan Island.